The heat has been unbearable today, well, I say “unbearable” by spoiled San Diego standards. It was 100 degrees in my neighborhood & I do not have A/C. Double UGH! Fortunately, I got some relief in a air conditioned building at work, but the Pug had to sweat it out at home. While contemplating what to make for dinner tonight I had two factors to consider: first – the heat (I didn’t want to turn on the oven) & second – it’s clean out the fridge time (new CSA share tomorrow). 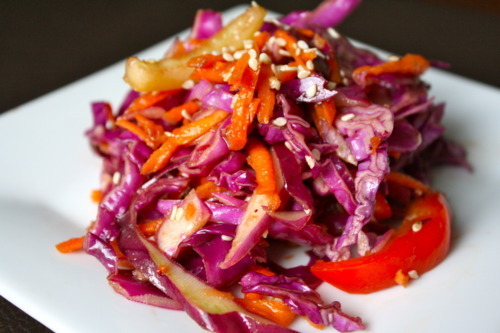 When my co-worker Kaila mentioned making an “asian slaw” a light bulb went on! I did a quick inventory from memory of what I had left in the fridge – head of purple cabbage, carrots, & peppers – perfect! While Kaila rattled off her recipe, I took mental notes, went home & made this lovely salad. Certainly not short of color or flavor. 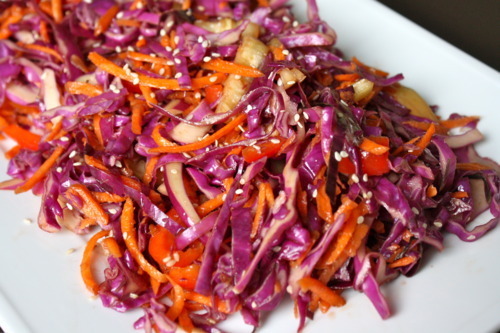 In a large bowl, toss together the cabbage, carrots, peppers, & sesame seeds. In a separate small bowl, whisk together the dressing ingredients. Pour over the vegetables. Toss to coat. Serve chilled. Enjoy! ***Quick Tip: If you have a food processor with a slicing disc, shredding cabbage couldn’t be easier! Here is what you do: Trim off the stem, quarter, & cut out the thick white cores on each piece of the cabbage. Process through the slicing disc of your food processor. You can also quickly process the carrots with the grating disc. This cool & crunchy salad couldn’t have been more refreshing on a blazing hot evening! Salade Niçoise Recipe from Très Green, Très Clean, Très Chic & a Giveaway!